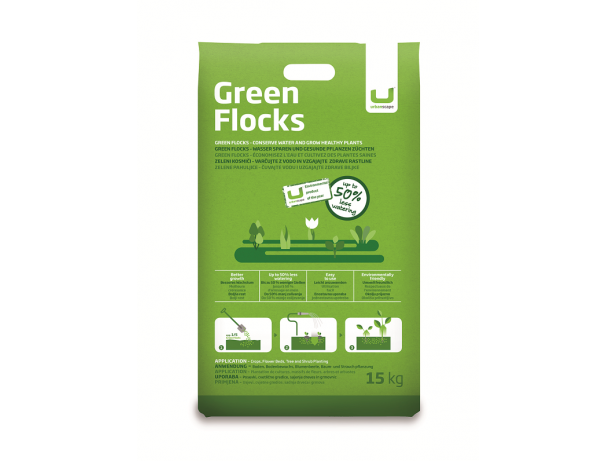 Green Flocks are made of natural mineral fibres with no additives or binders. They improve the air and water regime of the soil and thus increase water retention capacity. Water is trapped between the fibres and is gradually released into the ground. a higher number of inflorescence shoots and sprouts. planting pot plants in larger flower boxes. Mix Green Flocks manually or using a machine into your garden or field soil in a 1:5 ratio (mix 1/5 part flocks with 4/5 parts soil)..
Plant or sow your plants and water thoroughly. The Flocks should be covered by the soil. Green Flocks additionally retain water and the plant draws it as required. For an optimal effect, add Green Flocks to the substrate in a 1:5 ratio (mix 1/5 part flocks with 4/5 parts soil). Subscribe to our newsletter. Don't miss our special offers, new products and advices. Everything for your flourishing flower beds, lush green lawn and abundant garden.